Just like the previous Ripple Effect Romances, Lost & Found is a sweet, enjoyable, quick read. I love how these books flow into one another as a character is introduced and then the next book relates that person's love story. With each book being written by a different author, there is a slightly different feel to each book, yet there's the continuity you expect from a series while each book has a tone that is unique to its author & main character. Love it! Lost & Found is about Lydia & Blake. We met Lydia in Righting a Wrong - she's Jace's sister. Lydia has spent the summer in North Carolina with the intent to have an adventure, but alas she spent the bulk of the summer reading novels and the most exciting adventure she has to report is that she tried curry. As fate would have it, she meets Blake in the airport as they are awaiting the departure of their flight to Denver. The flight is cancelled and the two decide to delay their return to Colorado by two days so that Lydia can help Blake track down a box his recently deceased grandfather had left for him. Those two days become a sweet adventure that Lydia would have never anticipated. Lost & Found is simply put - adorable. I love Lydia & Blake and I love how they encourage one another and bring out the best in each other. They both are thoughtful and try to help the other attain their goals. That is what a true partnership is like - and I believe it's ideal for a lasting relationship. I can't wait to read Second Chances 101 - the next book in the Ripple Effect Romances series! FYI - clean read. No mature language or content. Honest disclosure - we received ebook copies of this book in exchange for an honest review. Lydia went to North Carolina to have an adventure. But it did not turn out how she planned it. At the airport her luck changes and she meets Blake. As they are waiting for the flight to Denver it gets canceled and they decide to have a little adventure. It includes hunting down an old friend of Blake’s grandfather. Lydia is a teacher and is very careful. But she takes ends up taking chances and being extra brave. I like seeing her take risks. I love the surprise that Blake plans for Lydia. I was sure she would chicken out but she surprised me yet again! They go a little Nancy Drew style at a assisted living facility and then they are off to find the box. But, what will be in this box. It is a great mystery. Blake is a workaholic and has a lot going on at work and they are breathing down his neck about this deal. Will this deal fall through because Blake took two extra days off to look for this box? We shall see. As they get the box of letters and the mystery unfolds. I wonder if Blake will see what is grandfather wanted him to learn from his mistakes. Reading the letters is wonderful and heartbreaking. I know if I were Blake I would feel exposed. Blake has a lot to think about. I wonder if he will make some changes to his life. This adventure has been eye opening for both Blake and Lydia!! What will they do?? I love Lydia’s thoughts on kissing. It cracked me up. The goodbye at the airport was priceless! And the ending perfect! Super sweet romance that kept a smile on my face until the last page was read. I would highly recommend this read! 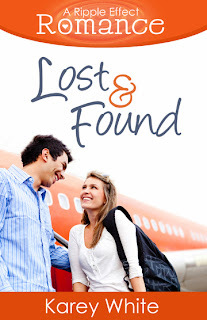 Lost and Found by Karey White is a perfect read. From the first page I was hooked and could not put my kindle down. This is the story of Lydia, Jace's sister and her summer adventure in North Carolina. She meets Blake and an adventure and romance unfold. My favorite part is when Blake surprises Lydia with a segway tour, which has since been added to my bucket list. Make sure you continue the Ripple Effect Romance Series, I know I'm looking forward to the next story. When Lydia approached her seat a few minutes later, an airport security officer with a shiny face and a little paunch was standing in the aisle by her suitcase. “Is this your bag?” he asked. “Yes. Is everything okay?” Why hadn’t she paid attention to the voice in her head? “Oh. Of course. I should have thought of that.” Did the movie star want Lydia to sit by him? Lydia rolled her eyes at her silliness. He was just trying to keep from being hassled any further. He went back to working on his laptop as she moved her things across the aisle. “Sorry about that,” Lydia whispered. “No problem.” He looked up from his computer and smiled. Oh. My. Wow! Up close his dimple was even cuter. The bigger the smile, the deeper the dimple. “Are you taking a trip to Denver?” he asked.